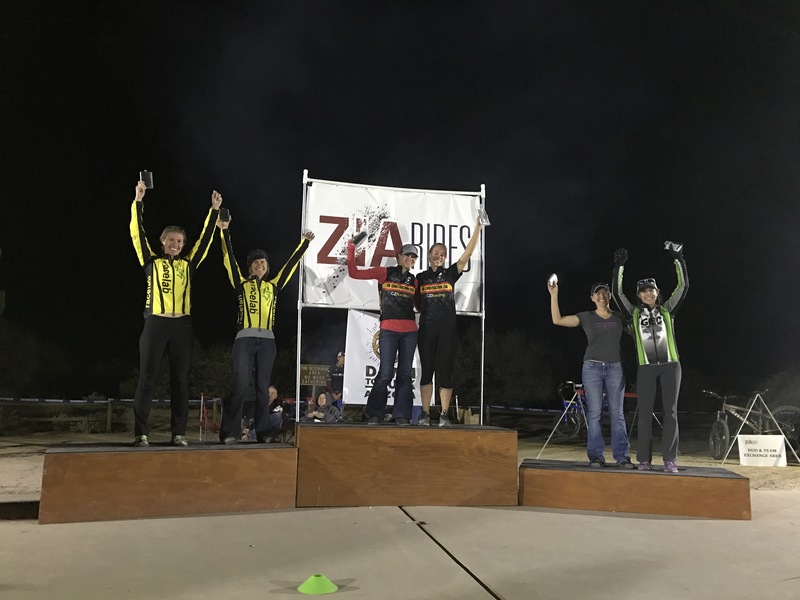 Dawn to Dusk is an Arizona classic mountain bike race held every December on the Pemberton loop at McDowell Mountain Regional Park. This year would mark my fourth time participating in the race, second solo effort, and Danielle’s first time on a female duo with her teammate Ashley. I started looking forward to this race last year when I managed to win the solo singlespeed category. Despite the win in 2015 I always felt like there should be an asterisk next to my name. I was incorrectly listed in the geared category all day so I was essentially a ghost rider amongst the singlespeeders. I have always wondered if the day would have played out differently if I had been listed in the correct category. 2016 was my chance to remove the asterisk and as the race approached everything was looking good. My fitness and strength continued to build from the progress I made last season and the weather forecast for this year’s race was looking primo. An added benefit was the number of strong riders registered in my category, the race was shaping up to be a great competition. My excitement for the race increased, until Thursday when I noticed that my throat was starting to show signs of trouble. When I woke up Friday morning my fears were confirmed, I had a sore throat along with some sinus congestion. This was definitely not the way I wanted to head into the race, but it was outside my control. Danielle had also caught the bug. After a short day at work we drove to the venue to drop off some of our gear and pick up our packets, then it was back home to get some food, rest up, and drink lots of hot tea with honey. Saturday morning came like molasses. Both Danielle and I slept terribly due to the onset of our sinus infections. It was 4 AM and I had our breakfast of rice and eggs ready when Danielle joined me in the kitchen almost in tears about how bad she felt and how little she slept. I wasn’t feeling too great myself and asked her if we should even race. Last time I raced sick it was an awful performance and ruined my training for another week due to not letting my body rest and recover, so I was torn about racing. Danielle was on a duo team and didn’t want to let her teammate down so we decided to press on and were out the door headed to McDowell Mountain Regional Park. Once we found a spot to park in the packed trailhead parking lot, I unloaded the car while Danielle attempted to catch a few more Zzz’s in the back of the Element. I anxiously paced around checking and double checking my pit area and making sure I had all my nutrition and cough drops laid out for easy access. After a final check of the bike, a last minute bathroom break, waking up Danielle and another bathroom break I was finally headed down to the starting line with my friends Matt and Ashley. After some pre-race instructions about being nice to one another it was go time and gun went off. As we headed out on that third lap Albert and I were trying to work together to put some distance between us and third place. As we started to climb I slowly started pulling away as I focused on maintaining a steady cadence up the gradual Pemberton climb. It’s hardly a climb actually, but the 3.8 miles at two percent grade can really start to wear you down if you are overzealous. Additionally, the climb gets a bit boring after a couple trips up, so it is easy to lose focus. I now found myself sitting in the lead position early in the race which was uncharted territory for me. I wasn’t sure what the proper strategy was in this situation so I made up my mind to keep the pace I was at and see how things played out. The third lap came out at only a minute slower and I was still feeling pretty good. Along with that, I was gaining some confidence that the pace I set was sustainable. The next few laps seemed to fly by as I continued to concentrate on being consistent up the climb and smooth and efficient on the descents. My lap times were slowing by about a minute each lap as the fatigue started to set in. Between laps three and seven I knew I was sitting in first, but I had no idea what sort of gap I had on second place. I started to get anxious about the remaining couple laps, wondering if I had enough energy left in the tank to hold off any attacks. As I came in from my seventh lap to pit and restock bottles and food, I happily saw Danielle there ready to encourage me and force me to take a few extra calories. She then informed me that I had a 13 minute lead and I simply grunted “that isn’t enough,” gave her a kiss and got back to pedaling. I haven’t mentioned much about Danielle or her race yet, but that is a good thing. I hadn’t seen her or her teammate Ashley at all during the race, except for brief flashes while I passed through the transition area. This meant they were having a great race as well and were keeping a strong pace themselves. I should also mention Danielle was incredible beyond her racing because she was my pit crew and always made sure my bottles were filled and accessible for when I came through to pit, regardless of if she was there or not. I could not have done this without her. Heading out on my eighth lap, was emotional for me. All of a sudden I was overwhelmed with the thoughts of how many people support me and were cheering for me. I am extremely grateful for all those people in my life that help me out along the way. I managed to get my act back together and re-focus and I had a new determination to finish this race out strong for them. Right about that time a guy named Lance joined me on the climb, and what a God send this was. He pulled me up the entire climb, encouraging me when I started to fall back. Just what I needed. We stayed together for a little longer until the flatter part of the course where he pulled away. People like that are one of the reasons I love the mountain biking tribe. Sure there are a few bad apples, but most of them, like Lance, are genuinely great people. I finished up that eighth lap and had a quick pit stop to install a light. If all went well I wouldn’t need it, but any mechanical issue would leave me on the course past sunset so it was a better safe than sorry moment. As I rolled through the timing tent, I saw my coach Dave and he let me know my lead had increased to 17 minutes, a bit more cushion to deal with was nice. That last lap I continued to push up the climb, but played it a little safer on the descents maintaining focus to pick the best lines and avoid any potential mechanicals or crashes. After 140 miles and 9:43 of saddle time, I rolled through the timing tent for the last time and I had done it, I had removed the asterisk that had haunted me for an entire year. I was thrilled to see Danielle and my coach Dave waiting to congratulate me on the win. Despite being sick, my body had done everything I had asked of it and my legs kept moving regardless of the stronger pace I had set for myself. One of the reasons I enjoy endurance sports so much is learning how far you can push your limits. It had been a great day on the bike for me, but even better was learning that Danielle and Ashley had placed second in a very strong female duo category. I was extremely proud of her and this accomplishment and how far she’s come on the bike. For almost not even showing up, it ended up to be great day of racing for both of us. And as expected the week following has been spent in a haze of over-the-counter drugs trying to fend off the full onset of the sinus congestion, but it was worth it. First Place! And a new flask! The calorie target was 200-250 cal/hr and the plan was to drink one bottle of Carbo Rocket Half Evil per lap mixed with 2 scoops (~222 calories). I supplemented with a few Fig Newtons and some Salt tabs throughout the day as well. This was consistent till lap 8 when I substituted some water and a First Endurance Liquid Shot to get some additional electrolytes to fight off a few twinges of oncoming muscle cramps that never came thankfully.